“Star Routes” got it’s name because legislation establishing the new mail service called for contractors to carry the mail with “celerity, certainty, and security.” Weary of repeatedly writing these words in ledgers, postal clerks substituted three asterisks “* * *” and the phrase “Star Route” was born. “Star Routes” was renamed “Highway Contract Routes” in 1970, but they are still known by their original name today. The contract mail route to the Havasupai IndianReservation, far below the rim of the Grand Canyon, is the last mule train delivery in the United States. 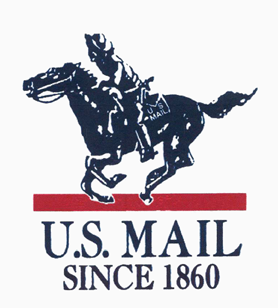 Post riders on horseback were the first contractors to carry mail between Post Offices. In 1773, post road surveyor, Hugh Finlay, noted that a stagecoach driver held a contract to carry semi-weekly mail between Portsmouth, New Hampshire, and Boston, Massachusetts. In 1785, the Continental Congress authorized the Postmaster General to award mail transportation contracts to stagecoach operators, in effect subsidizing public travel and commerce with postal funds. Despite their higher costs and sometimes lower efficiency, stagecoach proposals were preferred over horseback. An Act of March 3, 1845, took steps to reduce mail transportation costs. Congress abandoned its preference for stagecoaches, with contracts to be awarded to the lowest bidder for what “may be necessary to provide for the due celerity, certainty and security of such transportation.” 1 These were known as “celerity, certainty and security” bids. Postal clerks shortened the phrase to three asterisks or stars (***). The bids became known as star bids, and the routes became known as star routes. In 1845, more than two-thirds of the Post Office Department’s budget was for transportation. By 1849, the Department cut transportation costs on all routes — horseback, stage, steamboat, and railroad — by 17 percent, from $2,938,551 in 1844 to $2,428,515. Route distances rose 20 percent for the same years, from 35.4 million miles to 42.5 million miles in 1849. Star routes were largely responsible for the savings as contractors switched to horseback, cutting per-mile costs 38 percent, from 7.2 cents to 4.5 cents. Contractors had to be at least 16 years old until 1902, when the age limit was raised to 21. Subcontractors or carriers could be 16. Contractors were bonded and took an oath of office; subcontractors and carriers also took the oath. From 1802 to 1850, postal laws required carriers to be free white persons. Violators were fined. The typical four-year contract did not provide payment for missed trips, regardless of weather conditions. Unexcused service failures could result in fines up to three times the trip’s price. Regular schedules made carriers easy targets for thieves. Criminal punishment was harsh. Anyone found guilty of robbing carriers could receive five to ten years of hard labor for the first offense and death for the second. Meanwhile, some carriers faced the hazards of snow, avalanches, ice packs, cliff-hugging roads, seas of mud, and dangerous waters. Most star route carriers traveled by horse or horse-drawn vehicle until the early 20th century. Boats, sleds, snowshoes, and skiffs were also used. Today’s contractors use trucks, tractor trailers, and automobiles or whatever it takes — mule trains into the Grand Canyon, flat bottomed pole boats in the Louisiana bayous, and airplanes and hovercraft in Alaska. Dog sleds were used in Alaska until 1963. Today, mail is dropped by parachute on some Alaskan routes. During the winter, snowmobiles carry mail in the highlands of Utah, Colorado, and Montana. In The Story of Our Post Office, Marshall Cushing writes about Mrs. Clara Carter, who, while carrying mail between Maine’s West Ellsworth and Ellsworth Post Offices around 1892, also delivered mail to customers on the route. 6 Such unofficial arrangements were formalized beginning July 1, 1900, when some contracts provided for delivery to and collection from rural mail boxes erected along the routes. By 1918, some contracts also permitted the sale of stamps, money orders, and registered mail along routes. Star routes declined in the 1950s as unnecessary and duplicate service was eliminated. However, the 1960s saw growth as the Highway Act of 1958 improved highways while rail service declined. Between 1960 and 1970, star route miles more than doubled. In the 1970s, star routes officially became known as highway contract routes, although popular usage of the older term continues. At the end of 2006, the Postal Service had 16,707 highway contract routes. About 45 percent of these provided delivery to customers along the routes. 1. Public Statutes at Large of the United States of America from the Organization of the Government in 1789, to March 3, 1845, Volume V (Boston, MA: Charles C. Little and James Brown, 1850), 738. 2. U.S. Post Office Department, Proposals for Carrying the Mail in Maine, New Hampshire, Vermont, Massachusetts, Rhode Island, and Connecticut (Washington, DC: C. Alexander, Printer, 1853), 164-166. 3. Annual Report of the Postmaster General, 1859, 16. 5. Circa 1930 U.S. Post Office Departmet memorandum, files, USPS Historian. 6. Marshall Cushing, The Story of Our Post Office (Boston, IMA: A.M. Thayer & Co., Publishers, 1893), 40-41. 7. Congressional Record — House (80th Congress, 2nd Session), June 3, 1948, Vol.94, Part 6, 7104.